Your room tariff is inclusive of complimentary wifi, full breakfast & local taxes. This includes the Tui One Bedroom Apartment. Dinner is optional and available on request. Please contact us prior to your arrival should you wish to dine in on your first evening. NZD $95 per person – inclusive of all dinner wines provided with your meal. Children over 12 years are most welcome. Prices are in NZD and are subject to change without notice. Please provide us with a credit / charge card number. Within 30 days of arrival date: 25% forfeit. Within 14 days of arrival date: 50% forfeit. BAY OF ISLANDS IS MAGIC AND THIS PLACE HAS THE BEST VIEW AND THE BEST FOOD!!! We spent quality time determining where to stay in Bay of Islands and this was time well spent. The panoramic view from the living room is breathtaking and is accompanied alternatingly by classical music and classic rock, or your preference, whatever will enhance your pleasure. Your host, Peter Meier, has seriously impressive credentials and provides a welcoming home where the beauty of the land and his dinners are impossible to forget. (We declared our dinner at Cliff Edge to be our favorite meal of 2017! If you stay, you must request a dinner, you will not regret it!) 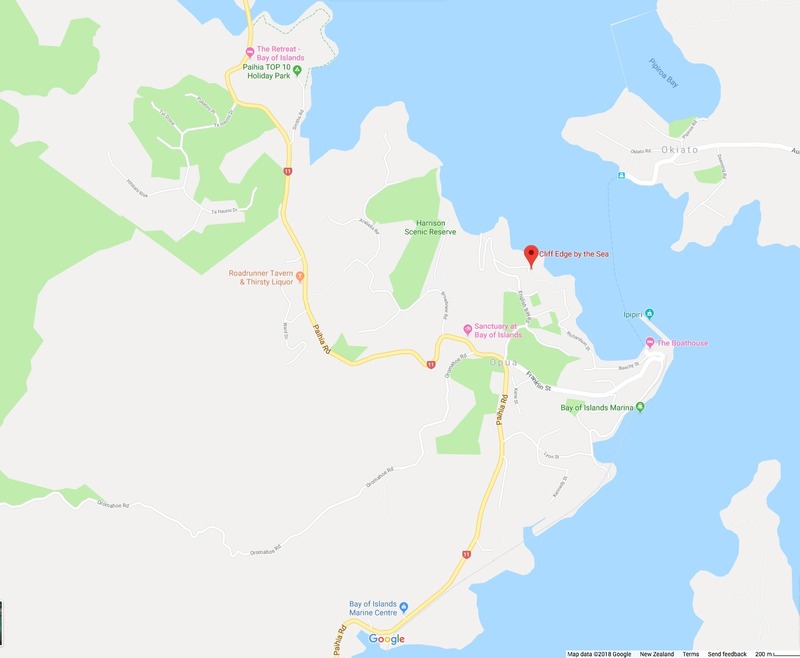 Honestly, if you have a car, do not bother to stay in Paihia as Cliff Edge is merely a few minutes away but seems worlds apart. This place has a unique sense of serenity and charm that is unforgettable. And Charlie!! The sweet house mascot will somehow elevate your experience even more… We hope to see Peter and Charlie again soon!! We stayed for while attending a nearby conference. Pete (the owner) was friendly and very generous. The home is perfectly positioned to make the most of the beautiful views. It’s layout works very well for both the single traveller and small groups. Amazing property, out of this world spectacular views, awesome decor. Peter made us feel totally welcome and pampered. Outstanding meal - prepared especially for us. A beautiful serene and relaxing atmosphere. The whole place is to die for!!! Would recommend to anyone if they wanted to get out of the "rat race" for a few days. Any of the rooms have spectacular views and king size beds with top of the line linens. Peter was a wonderful host and excellent chef. The view from our room- the Okiata- was spectacular! We would definitely stay here again. Dining with Peter is a must - he made our visit to the Bay of Islands exceptional.